Turf replacements are taking place at Ronald Reagan Medical Center (RRMC) and UCLA Medical Center, Santa Monica (UCLAMC, SM). 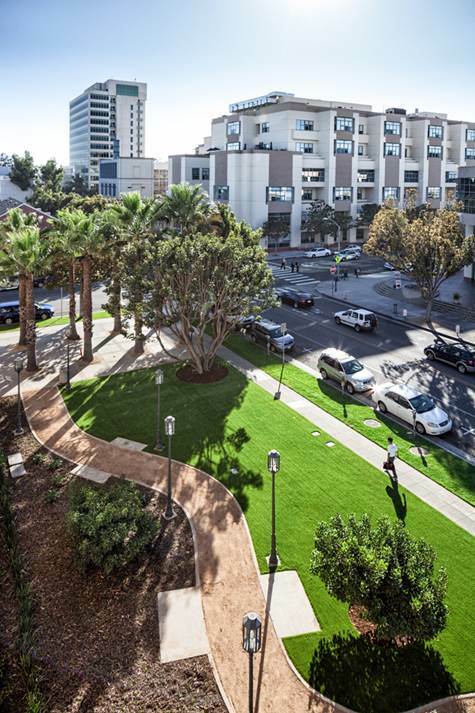 A 2,300 square foot pocket park at UCLAMC, SM is adorned with artificial turf and low-maintenance landscaping, saving an estimated 57,000 gallons per year. An 800 square foot area of an outdoor patio at RRMC has been converted to artificial turf with plans to replace the remaining 4,200 square feet in the upcoming months. The UCLA Health Facilities Department has installed a zero-discharge system for the cooling tower water at UCLA Medical Center, Santa Monica, which eliminates chemicals being introduced to the sewer system from the condenser water system and significantly reduces water consumption. Approximately 10,000 gallons of water per day are saved.